Hi, my name is Debbie and my fitness journey began just after Thanksgiving last year. I am 43 years old, married, a mother of 4 kids and as of October, a grandmother of 1. My favorite exercises are burpees (although they weren’t in the beginning) and any ab exercise and least favorite are double knee-ins. I originally started Texas Fit Chicks when my daughter expressed an interest in doing something about her weight. I was hooked after the first week and when the Groupon expired renewed for 6 more months. I have never stuck with a fitness regime like I have with Texas Fit Chicks. Not only do I attend the boot camp 3 days a week, but I work out at least 3 other days a week on my own. 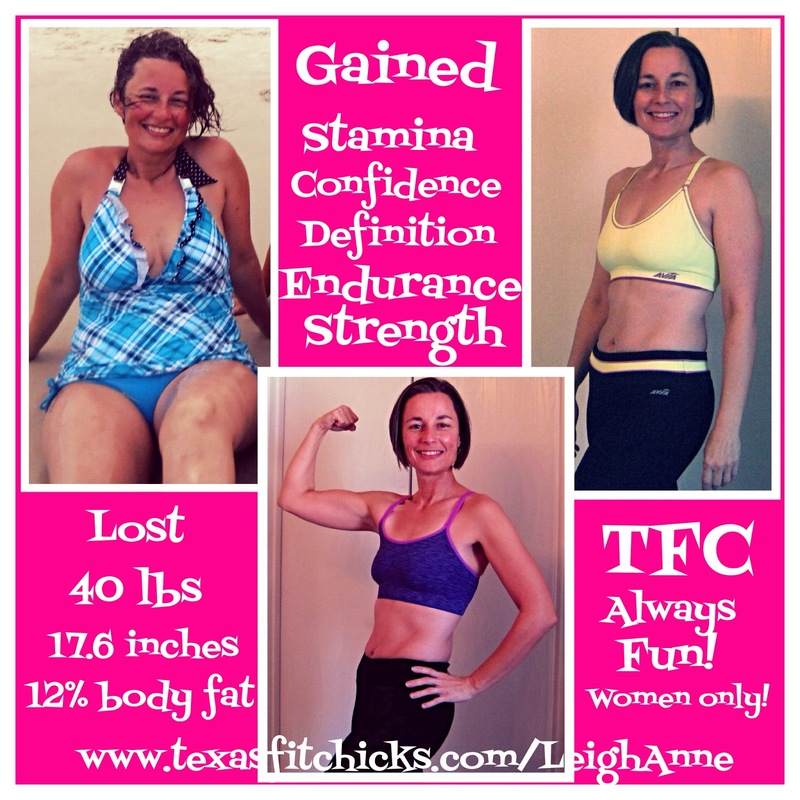 Texas Fit Chicks has not just helped me to lose weight but it has increased my stamina and helped me build muscle. Since starting my weight loss journey I have lost 40 pounds and 17.6 inches overall and decreased my body fat by 12%. Texas Fit Chicks has helped me to lead a healthier lifestyle not only for myself, but for my family as well. I love Texas Fit Chicks and especially my trainer LeighAnne. She is super motivating and constantly pushes me to be the best I can be! The workouts always vary and are always fun. To anyone thinking about starting a new fitness routine as their New Year’s resolution, stop thinking about it and give it a try. The workouts are infectious and you’ll be hooked too!! Thank you Texas Fit Chicks and LeighAnne! !